In this Photoshop Tutorial I show you how I make my custom kits for Football Manager 2017, this is for the 2D kit images only that show up on the club screen etc. I don’t need to make the shorts and socks as they get removed but will do so anyway. Did you like this?, if you did consider leaving a like and share to help promote the channel. Amazing kit mate, but what version of photoshop is this??? How would you go about using patterns from elsewhere as opposed to using shapes on PS to create something like the Nigeria kit, for example? can you make a new collar shape in Photoshop ? for example like a particular collar shape . great video!!! are these the best templates you can get? also can you get them free? Does it work in CS2? Did you buy the 15 dollar template? Amazing video, Thanks! Is it possible for create a club? 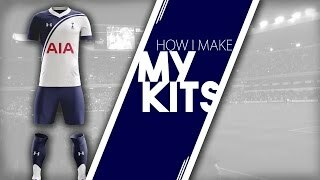 absolutely brilliant mate, been looking for a tutorial like this for quite a while now, one question i do have is how do you then get custom kits into the game? I’ve changed the inter milan kit and then added it to my kitpack in graphics but for some reason it isnt loading? i made sure the config has the correct id name and picture name but when i open fm it has reverted back to the default design before you apply a kit pack. Any idea what i can do to fix this? could you design a kit for us..